This was the first book by Sy Montgomery I had ever read, and it was good, but I don't think I'll be rushing out to read any others. I've been interested in octopuses for a few years now, and I liked reading about Montgomery's observations of them, and was especially moved by the relationships she formed with them, and how they affected her. However, I felt the book was a little bogged down by things I personally wasn't that interested it, although they would probably be fascinating to other readers. I cannot stand to read about scuba diving with burst eardrums. I know someone who burst her eardrum while scuba diving, and the vertigo that haunted her afterwards meant she had to stop working, socializing, pretty much do anything for the next four years. I also wasn't terribly interested in reading about the other fish that hang out at the aquarium. 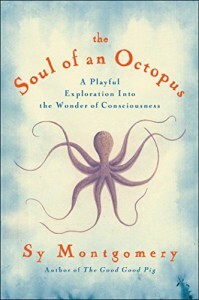 However, I did like reading about octopuses, and how amazing they are, although the subtitle of the book about the "wonder of consciousness" was a little misleading. I was hoping to read a little more about philosophy, and how we could apply it to creatures we have always thought of as being without feeling, or thought, motivated purely by instinct. The point was touched on briefly a few times, but this was mostly a memoir about falling in love with various octopuses.